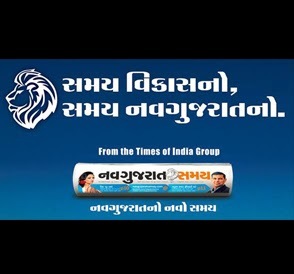 The Times of India Group launched a Gujarati daily, ‘NavGujarat Samay’, 16 january in Ahmedabad. The Times Group already has number 1 in Ahmedabad with 95 per cent readership share in English dailies. Times Of India Ahmedabad and Ahmedabad Mirror are leaders in their category. The group is campaigning aggressively for success of the daily.For that they introduced an introductory offer, wherein subscription for five months is available for Rs 99, along with assured gifts. NavGujarat Samay is Times Of India’s second regional language media space .The First is Bengali daily Ei Samay. and the second is Navgujarat samay Gujarati. The daily will have a total of 48 pages and a price of Rs 3. NavGujarat Samay has 2 front pages in 1 newspaper. This is a first ever innovation in any daily in Gujaratits innovative feature. Infact its delivers double the value newspaper readers.It has really premium and differentiate design,it will like by the readers.